Fall Fly fishing on the Frying Pan is some of the prettiest fishing in the state if not the country. The trout are big and strong after a summer of eating big bugs like drakes and the prolific hatches of PMD's, midges, terrestrials caddis and smaller mayflies. Usually the flow in the Pan is dropping a little as the irrigators reduces their call on the water so the river becomes easier to wade and therefore more accessible. 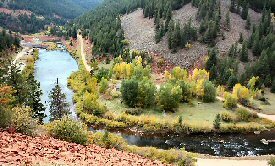 In our area we have a combination of great fall fly fishing opportunities, from fishing the Frying Pan, the Roaring Fork and Colorado, to float fishing the Fork and the Colorado. In addition the backcountry is still accessible as the hunters begin to scout for their elk for the upcoming season. The beaver ponds on the high mountain stream offer great opportunitites to trek a little to catch some brookies. So for a great Fall fly fishing experience, consider coming up and staying in our cabins on the Frying Pan River. Take a guided wade or float trip with us. Or just come up and enjoy the experience on your own in our delightful watershed. For an idea of conditions, refer to our archive of fishing reports from previous years for the fall period. This will give you an indication of the fishing possibilities and conditions for the same time period in previous years. "For the best in Fall Fly Fishing"